Suspense, mystery, mysticism, justice and a young boy coming into his own, I found this relevant, heartbreaking and deeply moving. Sweet, non-conventional romance with Southern flair! Fall in love with the natural world in this little nature field guide-travelogue. Reveling in Meera's words and her sense of wonder is the next best thing to being out there on the slopes of Sweden. I compared this to getting my "Breaking Bad" fix. Dark, weird, disturbing, appalling. A macabre tale hard to put down. Read any of Patchett's work? Here's an intimate look into her life by way of essays on life, love and commitment. Written in such a friendly voice, it feels like sitting down for a chat with the author. Got any good winter reads? Let me know! 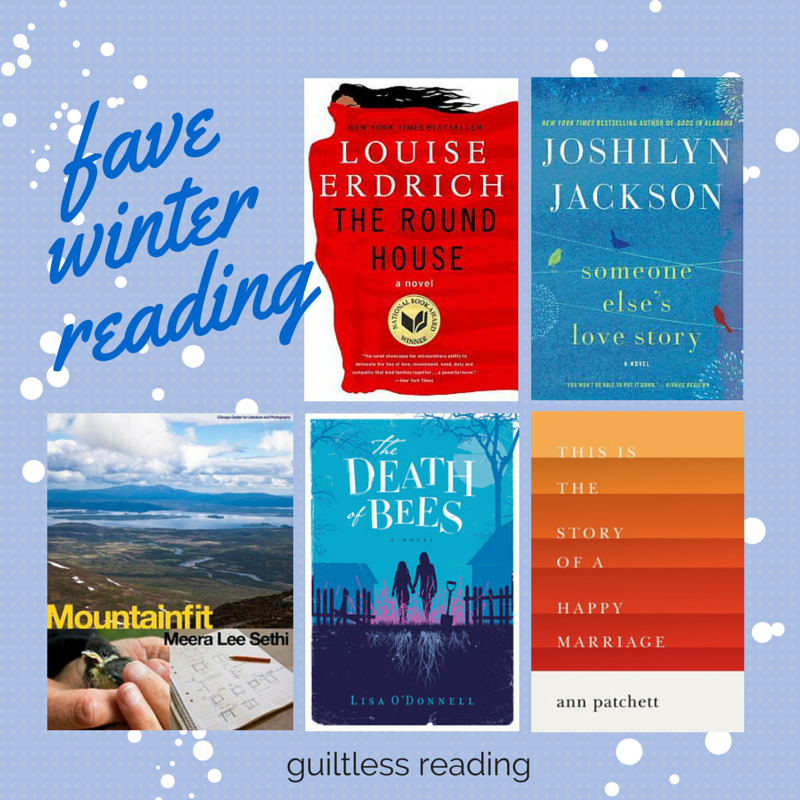 Want more fave winter reading? Link-up is over at Estella's Revenge! I loved Someone Else's Love Story! It ended up being so different than I expected. Was not a huge fan of The Round House. I have a small 'winter reading' shelf on Goodreads. It includes books about winter, books set in winter time and books that I like to read while snuggled up under a blanket while snow falls. I recommend The Snow Child by Eowyn Ivey. I also had to go back to Goodreads, I can never remember what I read when! Isn't it funny how quickly we forget??? I had to consult Goodreads, too. I soooo want to read The Death of Bees. That first line just hooks me!